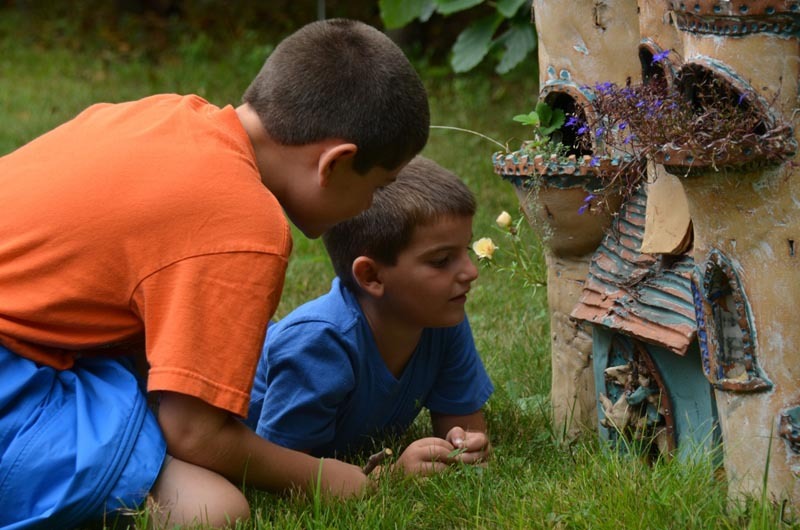 James and Christopher Bruschi discover following their imagination is way to go. An arrow and a butterfly peek out of the grass at Polly Hill Arboretum. Follow that arrow, and you will come across the beginning of a story about a young girl and a flock of butterflies. And as visitors follow the arrows on the tour through the arboretum the story unfolds complete with sculptures depicting different characters. The storybook exhibit is called A Walk Through Imagination and was created by The Mad Potter, Bill O’Callaghan, and his wife, Robin Tuck. This is the third year in a row the two have collaborated on this project, creating a different story each year. Mr. O’Callaghan became the Mad Potter 26 years ago, and he uses that madness in all of his artwork. In Ireland, where Mr. O’Callaghan is from, mad does not mean angry or insane, it means cool and exciting, he said. The nickname came about when he started using Irish and Celtic folklore as inspirations for his pottery. When Mr. O’Callaghan met his wife he started incorporating storytelling into his artwork. This year, their story is more personal and emotional than it has ever been. The Message of the Butterflies is a story about a young girl who doesn’t quite fit in, but learns acceptance and forgiveness with the guidance of butterflies. The young girl in the story is inspired by Robin’s daughter, Elke, who is visually impaired. Despite Elke’s role in the story, it is meant to be understood by everyone. At the beginning of the walk, you are told to look into a fountain to see the young girl’s face, but in reality, you are looking at your own reflection. The Message of the Butterflies is a story of forgiveness, happiness, love and light. 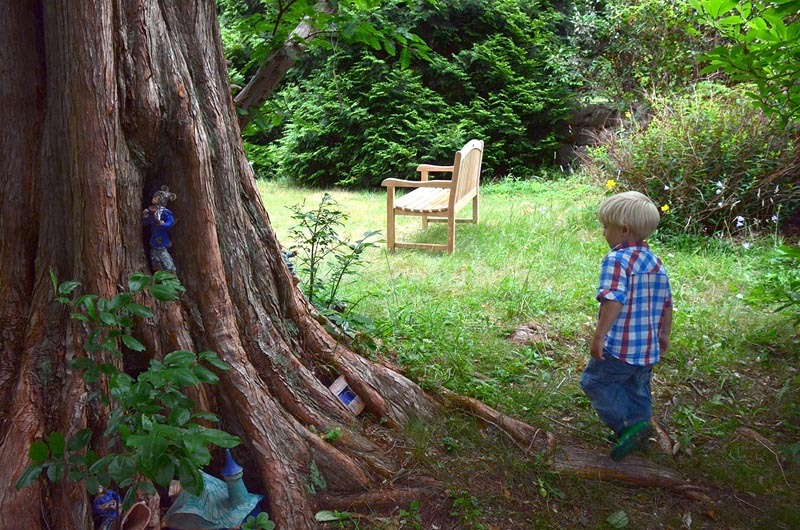 It uses the landscape of Polly Hill Arboretum and Mr. O’Callaghan’s pottery to create a world of fantasy and miracles. When walking along the young girl’s path there are dragons, owls, tiny dancing people, butterflies, castles and more. This year, Mr. O’Callaghan created his pieces around his wife’s story, rather than the other way around. “Last year it was tougher on Robin because she had to write based on an Irish tale. This year it was her turn,” explained Mr. O’Callaghan. The story is universal, meant to engage both children and adults, and also to help people connect with nature. Along with bringing people to the arboretum, the walk brings families together. Grandmothers reading to their grandchildren, brothers and cousins playing together in the trees, and children reading the story to their parents are common sights along the walk. For children and adults, the pottery adds life to the story and makes it real. The story and the art combined gives viewers a perspective on life. Whether it’s advice on how to deal with pain and problems, or on inclusion and acceptance, the story is an inspiring one. 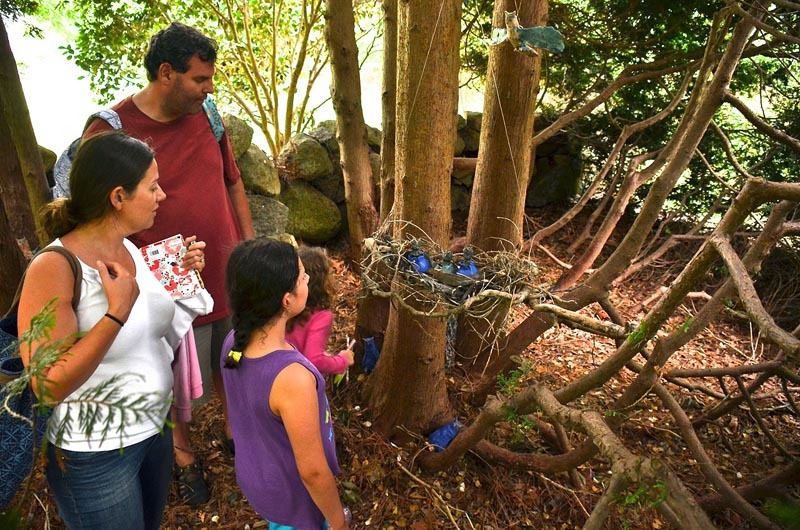 The Walk Through Imagination at Polly Hill Arboretum will be open every day from sunrise to sunset until August 15.